Tenants in commercial premises are becoming less concerned about the seismic strength of their building than they were a year ago, according to the Tenant Earthquake Risk Assessment Survey undertaken by Colliers International every six months. Only 9% of respondents in the latest survey have become more concerned about the seismic strength of their building compared to 38% who were more concerned a year previously. However the survey suggests older buildings with seismic ratings below 33% on New Building Standard (NBS) will be increasingly unacceptable to tenants, with 43% of respondents indicating a seismic rating between 33% and 67% would be appropriate and 45% considering a rating above 67% as appropriate. The survey also found that many tenants remain uninformed about their rights and obligation under their lease in the event of a major earthquake. Just under half knew whether their lease provided for them to have adequate access to their premises in the event of an earthquake and only 41% knew if a major earthquake could trigger a termination clause. Thirty seven per cent reported they they had specific access clauses and 31% said they had termination clauses. Colliers said the survey showed tenants' concerns regarding the seismic strength of their premises had stabilised and in some instances reduced. "Landlords are now much more aware of their requirements and of the tenants' perceptions about seismic strength and government regulations, time frames and costs." Colliers report on the survey said. 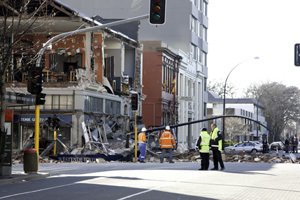 Colliers also said that many leases would be coming up for their first renewal since the major Christchurch earthquakes and that could provide opportunities for tenants to have clauses around earthquake access and termination inserted into them.